Came across this picture I had taken on my cell phone... The husband (my attempt at humor) and I had headed out for a quick dinner at a nearby Applebees which happens to be in the same shopping plaza as a Walmart when we came upon this "girl" (below) hula hooping through the parking lot as if it was the natural thing to do!!! I wanted to sneak a picture and we ended up following her into a nearby manufactured home park (lol)....where she actually seemed to be camera shy!!!?? I don't know whether to be jealous of her "free spirit" or mortified that she was hula hooping while wearing this outfit in public?? pps She looked as though she may have been "with child"
One of the things on our Summer List was to go raspberry picking. 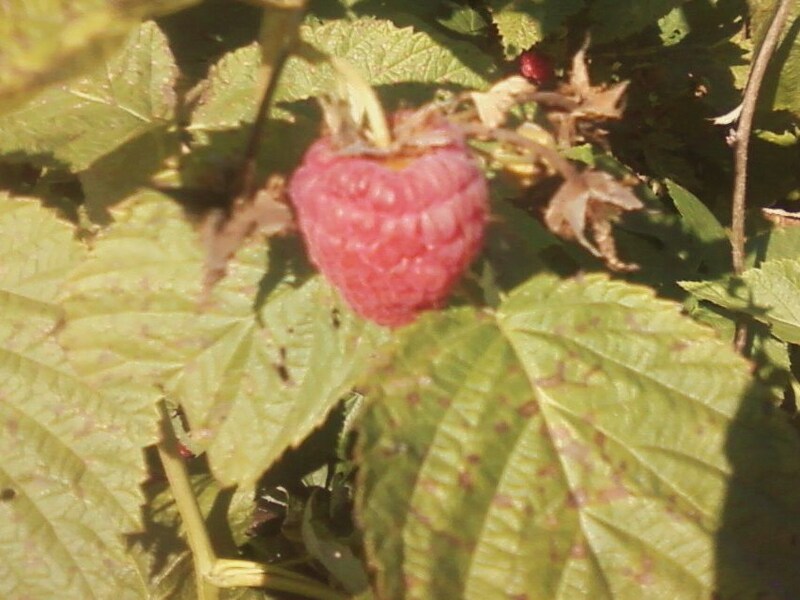 Doesn't everyone like raspberries? We LOVE 'em and are willing to work for them (instead of paying $4 for a pint at the grocery store)... So earlier this week, after taking Grandma to her "Senior Club", me and my three kiddos set out to an orchard about a half hour away. 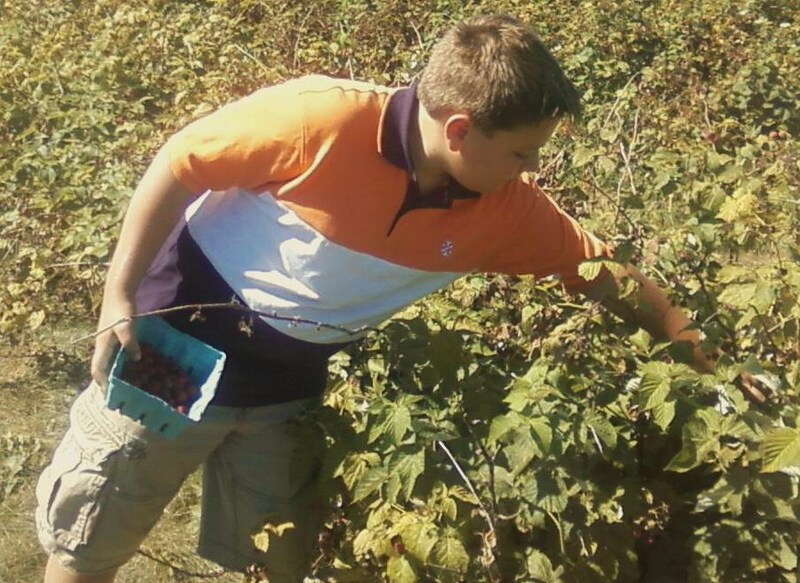 I had called ahead to make sure they were "picking" and they were. 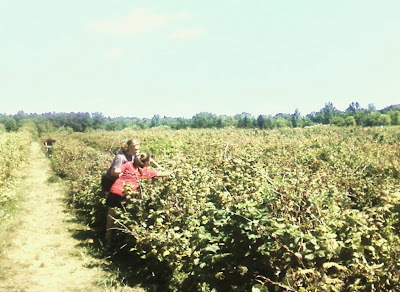 When we arrived, we took a little tractor-pulled hay wagon ride out to the raspberry bushes. There were about ten people already out picking. This was our first time picking raspberries at this orchard. Normally, we go for raspberries at a smaller orchard by our place up north. Honestly, we were a little disappointed that the picking was not great on this particular day. Of course, we like it when the ripe raspberries are plentiful and you can fill your quart pretty much just standing in one area... That was not the case -- we had to do some serious searching. Lots of walking, looking under the leaves and down low, etc... We worked hard -- like farmers!!?? It was kind of a bummer and we had a hard time getting 4 quarts (one each). Has anyone else tried any of these products or received any fun surprises like these in the mail?? It beats getting "bills" any ol' day, right!? This one was quite tastefully packaged! I put this one in my purse for a "snack attack"
Yes, they offer samples of EVerything! A free pen (the blue one is real)! I have to say, I love the idea of "Christmas in July"! Of course, nothing compares to my favorite religious holiday celebrated on December 25th. However, I just love the thought of Christmas in July... Not like let's get our Christmas shopping done, or let's put up the tree, but just the idea of fun summery activities coinciding with Christmas. The reason is probably simple...we live in Michigan, and I have celebrated all of my Christmases here...in the winter. Don't get me wrong, nothing beats a white Christmas here in the Great Lakes State, but I do love my iced tea and flip flops, too! When my husband and I were first engaged we had a Christmas in July party! Such a fun theme...Santa and Mrs. Claus (a/k/a our crazy friends) even stopped by. Those were the days! I LOVE watching them dance...and "The Jake" is pretty darn good! The Husband Celebrating with his "True Love"
It's Monday again...time for another entry about my mom and how she's doing (and how we're doing). In spite of lots of setbacks, there are some things heading in a positive direction. One thing in particular is that I was made aware of "Encore", an adult day service specifically designed for seniors who are unable to initiate their own activities. This is key because, unfortunately, my mom does not "think of" things to do to occupy her time. She rarely calls anyone or reads on her own. I normally initiate the activity for her. In my quest of looking for an appropriate living situation for my mom, I learned of the "Encore" program which takes place about 5 miles from my house. It has been a godsend for my mom, me and my kids. It gives her some socializing time with other seniors and me some time to just be with my kids. I can't say enough about the Director and volunteers who work with this program. They make my mom feel so welcome and special and she just LOVES it! This particular program is actually designed for senior's with memory impairments such as dementia, Alzheimer's Disease and Parkinson's Disease. For my mom, we call it the "Senior Club". Nobody (especially my 67-year-old mom) wants to think they are going to "Adult Day Care". Before I brought my mom, I had an extensive "intake/application" process with the Director. They were very thorough wanting to learn about my mom, her health, her personality, likes and dislikes, etc.... I was so excited because I knew if my mom gave it a chance she would love it. The first day I brought her to the Senior Club I was so nervous...literally felt like bringing my first child to her first day of preschool. Afterall, it was the first time in 4 months that I was going to "drop off" my mom with people she did not know. Well, from the moment she walked in and they said "are you Mary?" and had a name tag all ready for her...well, let's just say they had her right then. Everyone gathers in this big circle of comfy recliner chairs (see below)....there's music, snacks, lunch, current events, weather, horoscopes, themes each day, etc... When I picked her up 5 hours later...she was singing away in one of those chairs and when she saw me, she literally "shooed" me away with her hand!! I couldn't have been happier!! If I could afford it, she would be there almost every day!! (It's $35/5 hours and $45/up to 8 hours. Very reasonable prices, but she does not have that extra money and, for now, we are paying for it once a week. She has gone four times so far and it's been great. Last week me and my 13-year-old daughter walked in to find some of the seniors were literally having a "squirt gun fight" (yes, indoors!!!???) Too funny...I wish I had it on video. My mom had sooooo much fun and says she wants to have a sleepover...with alcohol!!?? She's a crack up sometimes! A comfy gathering place for "Senior Club"
The week before when I picked her up they were just dishing out the "double chocolate cake" and sugar free ice cream to celebrate a birthday. Right away, they asked if my mom wanted hers "to go"... Well, if you know my mom, you know the answer was "yes please"!!!! Also, for those wondering, I did attend the "Alzheimer's Caregiver Support Group" that I referred to in last week's post. I will share that experience very soon, and I appreciate the encouragement from other bloggers -- I'm not sure I would have gone without it. In the meantime, "Encore!" for Encore! I was kind of laughing when I re-read my Friday post about the "Lemonade Stand" that didn't turn out exactly how I would have liked. I hope I didn't scare anyone...lol. It is just disappointing when you're kids don't behave as you would like. It was mostly good, and I really wasn't as mad as I may have come across. One of the things on our Summer List was having a lemonade stand. We have done this in the past and the kids have always thought it was the greatest. 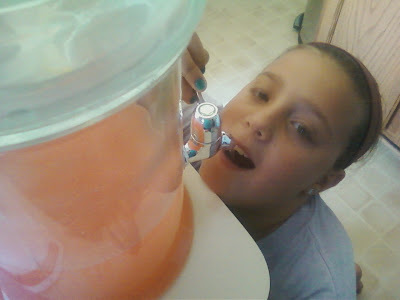 I really thought they were too old for a Lemonade Stand but they wanted to have one -- I think mostly to "make money". The problem is you have to be home to have a lemonade stand and you have to be stocked with... lemonade stuff. Recently, when we found the cute little accessories on Target's Summer Clearance it reminded us it is time to sell lemonade. So that, combined with record high temps, we decided yesterday was the day! I did my running around in the morning so we could be home for the afternoon. We decided to make it a Lemonade and Fresh Watermelon stand. Sometimes I wish this was one of those "perfect blogs", with the perfect house and the seemingly perfect mom and children. It's not. I have higher expectations for my teen and tweens than when they were younger. The truth is cooperation was lacking between siblings. The cleanup did NOT go smoothly and there was a lot of unnecessary bickering. I also would have preferred that my kids did not see $$$ signs in their eyes when a few generous people insisted on overpaying for the lemonade. In the end, I think the heat got to everyone (crabby!) and perhaps it was even tooooo hot for a lemonade stand!? So, what started with good intentions will now be known as our LAST lemonade stand. My kids are not cute and little anymore...they are bigger and sometimes they even forget to treat each other with respect. I was disappointed at the lack of cooperation. Thankfully, they are not like that every day. Perhaps what they did learn now that they are older is that making money is often less about fun and more about work! So, this mom says...lemonade stand CLOSED! **This was one of my Target deals!﻿ So worth it !!! We had popcorn for "lunch" yesterday...it was free popcorn day at the movies! I just realized I musta had an ok week...I'm having trouble "so whating"!! Here's a follow up to this morning's post. If anyone is curious what I do with some of that "stuff" I bought, here is a little gift I put together for a family friend who has been entertaining two of my kids almost every day this summer. A little package of summertime fun! It's not my most beautiful looking gift (I was in a rush), but it sure is packed with some goodies!! ps... I mighta accidentally gone back to a Target today, there was only one worthwhile Summer Clearance item left, and my daughter insisted I buy the remaining 10 boxes... If you read all the way to the bottom, it will be our little secret. Jennifer, do you need any? Okay, this is fun! Nothing like a little retail therapy to make you feel better! (At least until the Visa bill comes!?) Yesterday I went to 4 Targets in about 5 hours scavenging for Summer Clearance items. I had also gone last Thursday and Saturday, but was a little disappointed that the items were at 50% off then. Is 50% off good? Yeah, it's awesome! However, when things are 75% or more...that's what I'm talking about! The gazebo*? Now that was a fluke! Someone at Target put the gazebo box in the Summer Clearance area. It was already marked down 75% ($62.25), and I asked if they would sell it to me for the 80% and the manager said he would ($50.00). Meanwhile, I didn't even know if it would fit in my car, but it did!! Such a deal!!! Now, if someone can just tell me how to make a proper collage with my pictures, I would be happy! Meanwhile, I'm going to try really hard not to go to Target today!! Pizza + Metro Detroit = Buddy's! Yes, We Did Have Fun at the Grad Party! Two of My Favorite Words..."Clear" and "ance"!